A train carrying coal derailed near Noxon, Mont. on Sunday evening. The Clark Fork River is in the foreground. Photo by Mary Franzel. At about 11 a.m., approximately 30 cars derailed near Noxon, Mont., a town near the Idaho border and about 50 miles west of Thomson Falls, Mont. The cause of the derailment is still under investigation, and as of Tuesday afternoon, rail traffic is moving on the Montana Rail Link mainline. According to Montana Rail Link spokesperson Jim Lewis, the coal that spilled from the shipment is not considered a hazardous substance under federal regulation. Local water quality advocacy group Lake Pend Oreille Waterkeeper disagrees, saying that several studies have shown coal to have an adverse effect on water quality. Lake Pend Oreille Waterkeeper Director Shannon Williamson said coal has been a major concern of the organization lately. The Waterkeepers’ attention was recently focused on a lawsuit against BNSF by environmental groups that was recently settled. Environmental organizations alleged that escaped coal and coal dust from train cars has an adverse effect on water quality and public health. While BNSF denies any violation of the Clean Water Act, it will conduct a two-year study into the feasibility of car covers for coal trains. 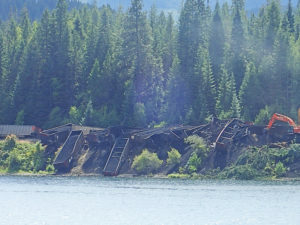 Williamson said Lake Pend Oreille Waterkeeper is also urging the drafting of an emergency response plan should a coal train derail within the region. The group will advocate for the adoption of such a plan when the Lakes Commission reviews plans for catastrophic spills —to date largely focused on oil spills — at its Aug. 25 meeting.